Time for a new salad! Yesterday, my father installed their old five-burner stove in my kitchen. I'm super happy with this! So it had to be used straight away! Namely to grill the leftovers of the eggplant afor in my salad today. Not the most exciting type of cooking, but okay. This week, the stove will also not be used that often because today it's my Grandma's birthday, so I'm going to eat there. And Tuesday, Thursday and Friday I will eat leftovers from the freezer. Why? Point 1: to reduce costs; my laptop is broken and needs to be replaced. Point 2: My freezer really needs to be defrosted and before that I need to eat the containers in it. Cut the eggplant into thin (but not too thin) slices. Put on your work surface and cover with a thin layer of olive oil and salt and pepper on both sides. Put a grill pan over high heat and when the pan is hot grill your eggplant for about 5 minutes per side. Beware that it does not burn and turn around before they are black. Meanwhile, cut all the other ingredients and toast the pine nuts. Mix the dressing in a small bowl and add all together if you're going to eat. Last night Charlotte came over for dinner. The time flew by which is always a good sign! Because I really liked the oven pans of last week and it's also tapas like food, I decided to make it again today. The plan was actually to just make the same mushrooms, with two other pans, but I had forgotten the coconut milk ... so no Indian visurry but again the stewed fish. Also a new delicious chicken pie! make the chicken broth and cut the chicken into strips. Cook the chicken for 10 minutes in the broth until done. Meanwhile, brush the slices of filo pastry lightly with olive oil and also the inside of the oven pans. Put the slices of filo in the pans and press well into the corners. Leave the rest over the edge. Divide the chicken and sliced ​​sundried tomatoes over the 2 pans. Beat 2 eggs with 100 ml of cream and stir in the grated cheese and finely chopped rosemary leaves into through it. Pour over the filling and fold the dough casually back so it does not hang over the edge. Bake, uncovered, for 20 minutes until golden brown. Time for a new recipe from Charlotte! A salmon lasagne! Preheat the oven to 200 degrees of Celsius. Finely chop de onion and garlic and fry on medium to high heat in a bit of coconut oil. Add the spinach and shortly bake along. Bring to taste with salt. Grease an baking dish. 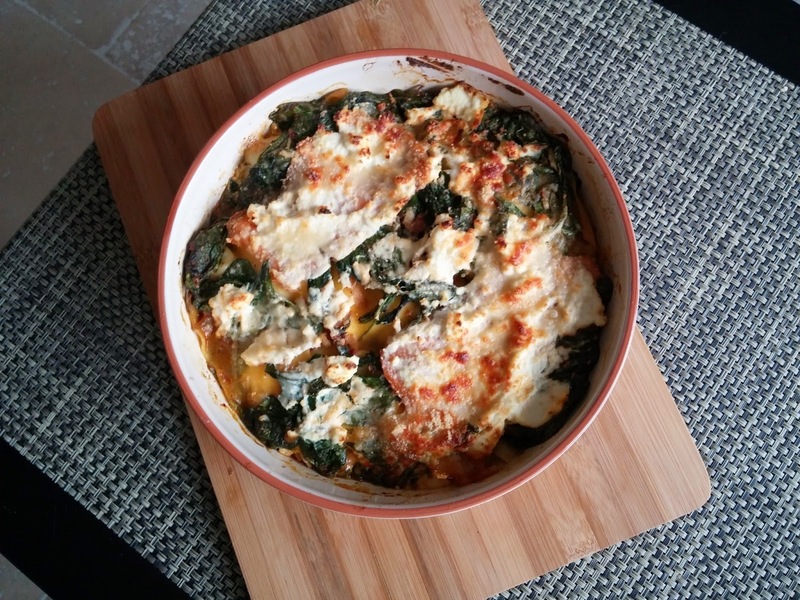 Start with a layer of spinach followed by lasagne sheets - spinach - salmon - ricotta - sheets - spinach - salmon - ricotta. Make sure you end with ricotta. Bake the lasagne for 30 minutes in the preheated oven. Last Sunday I went to train in the studio I move for health together with Charlotte. It was a good training and Charlotte suprised me with two pieces of her freshly baked and delicious mulberry cake! Optional: a ts hennep proteinpowder, hazelnuts or other nuts, cacao nibs or a ts chai. Preheat oven to 180 degrees Celsius. Grab a cake pan/tin and grease it with coconut. Mix the eggs, almond flour, banana and macadamia milk with a pinch of salt in a large mixing bowl with hand mixer or in your blender. Put the mixture into a large bowl and stir through the oats, mulberries and baking soda. Bake in a preheated oven for 40 minutes. Check after 30 minutes with a toothpick, if it's dry and no cake sticks to it the cake is already done (Every oven is different so keep an eye on the cake). The cake is perfect after a good workout with a bit of quark, but also alongside a cup of tea/coffee or as a healthy snack during the day. I actually don't know if this is the correct term for the small oven pans with lit I used today. In Dutch I just call it 'ovenpannetjes' or 'stoofpannetjes'. After a search on google I found the terms french oven and oven pans. But, in short, today I had 3 absolutely delicious dishes from the oven. Mushrooms grated with cheese, mussels grated with cheese, and an Italian fish stew. It took me 15 minutes to prep and the time in the oven is a bit different, just see below. For each dish the oven needs to be preheated to 175-180 degrees of Celsius. I served it with a couple of slices of bread and homemade herb butter. Simply mix the butter with the finely chopped parsley and one crushed garlic clove. Season with salt & pepper. Heat a dash of olive oil in a skillet over medium heat and bake 1 clove of garlic for 1 minute. Meanwhile, quickly cut the mushrooms into wedges and the onion in small pieces. Put this with the garlic in the pan and cook for about 5 minutes. In the meantime, you can make the vegetable stock and do not forget to stir the mushrooms. Put after 5 minutes 100 ml vegetable stock with the mushrooms in the pan and cook over a high heat for 3 minutes. Keep stirring well. Grease 2 oven pans with olive oil and divide the mixture between the two pans, stir 1/2 tbsp parsley through each pan and divide the herb butter over the pans. Sprinkle each pan with a tablespoon of grated cheese 30 + followed by a tablespoon of grated Parmesan cheese. Bake uncovered for about 15 minutes in a preheated oven at 175-180 degrees. Cut the leeks into pieces and fry about 1 serving spoon in a little olive oil with 1 crushed garlic clove for about 3-5 minutes. Grease 2 oven pans with olive oil and cut the fish and paprika into pieces. Put this in the pans. Add the leek and 150ml tomato cubes per pan. Tear some fresh basil and stir through. Put them with the lid on for about 25 minutes in a preheated oven at 175-180 degrees Celsius. Check whether the fish is cooked because then they are ready. Fry the leek with 1 crushed garlic clove in a little olive oil for about 3-5 minutes. Then add the vegetable stock and cook for 3 minutes. Grease 2 oven pans with olive oil and divide the cooked mussels over the pans. Pour over the leek mixture with the remaining broth. Sprinkle with grated cheese and place, uncovered for 15 minutes in a preheated oven at 175-180 degrees Celsius. In this guest blog you will find the 3 favorite pasta's from Charlotte from Charlie's Kitchen! First up this delicious tagliatella! Cook the kamut tagliatella as indicated on the package. Bake the minced chicken along with the cloves of garlic and shallot in about 8 minutes or until tender. After a few minutes add the spinach. Put the tomatoes in a blender along with 2 tablespoons of oatmeal cream and mix until it has become. a smooth sauce. Then put the tagliatella in a large pan or wok with the sauce and minced chicken and let it stand for 5 minutes on low heat. Cook pasta as directed on the package. Cut the chicken into cubes and fry until golden brown in a little coconut oil. Meanwhile, cut the zucchini into strips and olives in half. Put that with the chicken in the pan and bake until everything is done. Drain the pasta and add to the pan with the chicken. Press 2 garlic cloves over it, cut the bunch of chives finely and add the can of tomato puree and a teaspoon red curry. Stir well and let it sit for 2 to 3 minutes. Serve the pasta with fresh basil leaves and a little Parmesan cheese sprinkled on top. This is definitely my favorite cheat meal! Cook pasta as directed on the package. Drain the pasta, put the pan back on the heat and add the gorgonzola . Stir until soft and then add the bacon so that there is a creamy cheese sauce. Let this simmer for about 5 minutes. Put a handful of arugula on each plate and spoon the spaghetti on top. Enjoy this delicious cheat meal! Yesterday I went walking with a friend through Amsterdam. We had a fun time and to end the lovely summer day I made us a delicious egg plant risotto! Perfectly light and fresh of taste. Heat a splash of olive oil in a frying pan on medium-high heat and cook over a liter of water in the kettle. Meanwhile chop the onion. Put the onion together with 3 crushed garlic cloves in the pan and fry for about 3 minutes. Add the rice and fry along with the onion for another 1 to 2 minutes until the rice is translucent. Crumble over the stock cube and add a dash of hot water. Stir well until it is absorbed by the rice. Reduce the heat and add another dash of water (not too much at a time) and continue until the rice is tender. This takes about 20 minutes, stirring frequently. Meanwhile, cut the mushrooms into quarters and the egg plant into cubes of your desired size. Drizzle over some juice of the lemon over the egg plant so it doesn't turn brown. When the rice is cooking for about 10 minutes, heat up another splash of olive oil in a frying pan on medium to hight heat. Add the mushrooms and egg plant and cook 5 to 7 minutes until tender. Meanwhile, torn a large handfull of fresh basil leaves. Turn of the heat when the rice is cooked and stir through the ricotto, Parmesan cheese and torn basil leaves. Stir the vegetables through and leave the lid on the pan for 3 minutes. Serve with some extra freshly torn basil leaves and parmesan cheese sprinkled over it. Tonight it was time for a couscous. A quick meal and this time also very budget because I have used ingredients that I had lying around in the fridge. But by adding some garlic and fresh herbs is always a tasty meal! Personally, I always use spelt couscous. And good news, it is now readily available at the AH (a dutch supermarket) on the shelf with the rice! Ideal and I am glad that the good and healthy products are also becoming more accessible to the general public! Cook the couscous as directed on the package. The one I use is super fast and ready in just a few minutes. When the couscous has to wells at the end I always stir in a small piece of butter for extra flavor and that also makes it nice and smooth. Cut the onion and zucchini into small pieces and fry for about 6 minutes over medium-high heat in a little splash of olive oil with the crushed garlic cloves. Season with salt and pepper. Cut the paprika and put it in the pan with the zucchini after 2 minutes. Dice thefeta cheese and figs and tear the basil leaves. Serve with feta, basil leaves and figs sprinkled over it. Time for a new curry recipe! I'm a bit in a hurry to get to the gym because I have an appointment to get a new fitness schedule so no big intro today. Cook the rice as directed on the package. Steam the cauliflower florets for 8 minutes or until tender. Heat a splash of olive oil in a frying pan over medium-high heat. Cut the chicken into small pieces and fry for 8 minutes in the pan. Meanwhile, cut the onion and paprika and put it after a few minutes in the pan with the chicken. When the chicken is cooked add the coconut milk, the crumbled chicken stock cube and madras curry paste and bring to a boil. Cook for about 10 minutes. Put the cauliflower and peas with it and cook for another 3 to 5 minutes. Season to taste with salt and pepper and serve the curry on rice. After more than two years it was finally time to use my quiche form for the first time. I never used it before because quiche usually is made with puff pastry, and I try to eat this as little as possible. But when I was gaining inspiration in my cookbooks, I found the recipe for the dough in a Dutch cookbook from Amber Albarda. I found her recipe for the stuffing a bit too complicated, too much work with too many ingredients. So I have made my own filling based on her recipe. It does take some time to make the dough but that's just because you have to make it from scratch, but it's worth it! Soon I ill try other variations. Do you have a request? Leave a comment and who knows, maybe yours will soon be in de making! Grease the quiche form with butter. Toast the oats and sesame seeds in a frying pan without oil or grease for about 5 minutes. Put them together with the spelt meal, baking powder, salt and pepper in a food processor and grind finely. Put it in a large mixing bowl. Pour the olive oil into a measuring cup and then add the water. Pour into the mixing bowl with the flour and use a hand mixer with dough hooks to make dough out of it. Do you have a food processor that is equiped to make dough, then you can also use this. Is it mixed? Then knead a bit more with your hands. Roll out the dough on a floured surface to a round piece and put it in the quiche form on the bottem and the sides. Put the form in the refrigerator and preheat the oven to 175 degrees Celsius. Know it's time to make the filling. Chop the onion and cut the zucchini into thin slices which you then cut in half. Heat a tablespoon of butter in a frying pan or wok and add the 3 crushed cloves of garlic with the chili powder. Fry the onion and zucchini for about 10 minutes. Meanwhile, put the spinach into your food processor in small pieces (my food is not so large) and grind finely. Place in a bowl and stir in the ricotta cheese and white wine vinegar. Chop the basil coarsely and put it together with the thyme leaves in the bowl wit the spinach. Beat 2 eggs and also stir through the spinach. When the zucchini and onions are ready you sprinkle it with salt and put it in the bowl and stir well. Divide the spinach mixture on the bottom of the quiche. Bake the quiche for 45-50 minutes in the oven. Allow to cool before you cut the quiche. This morning it was time for Beach Bootcamp! Occasionally we have Bootcamp on the beach in Castricum, half hour drive and you're already there and it's super fun! It was gray and dreary weather this morning but with a lovely temperature and against all odds, we kept it dry! Happy! And actually it was also nice that the sun was not shining. After the win last night of the Dutch National Soccer Team everybody had a little hangover so the fresh sea air has done us good! Bootcamp on the beach is very different from what we normally do in the park. It has a higher 'fun' element and of course running through the sand is much heavier. We've done all sorts of bootcamp exercises with and without a competitive element and yes, some exercises we have done in the sea. Burpees in the sea, what more could you want! Below you can see some pictures of what we've done. With my workout buddy Lizzy after a swim in the sea! Tonight it's time for Netherlands - Costa Rica!! Sunday I ate my orange sweet potato burgers during the match, and then they won so I thought tonight I will make another orange dish ! Bit superstitious but that's okay! Recipe is originally from a Dutch website (Uit Pauline's Keuken) with a slight modification. It is a quick and easy dish with perfect taste combination. Peel the skin of the sweet potatoes using a peeler and cut into equal pieces of about 3 inches. Boil them with salt for 10 minutes until they are done. Meanwhile, coarsly cut the rocket, cut the sun-dried tomatoes into pieces and the feta cheese into cubes. Drain the potatoes when they are ready. Sprinkle with the sweet paprika powder, add salt and to taste and grind to a fine stew. Stir in the arugula and sundried tomatoes. Serve with feta cheese on top. Tonight a friend came over for dinner, and on the menu was this delicious parmesan-chicken from Delicious. Magazine served on top of a green quinoa salad.I actually got a subscription to Delicious Magazine from her for my birthday! We had dish delicious dish on my balcony in the sun. For dessert we had, of course, my guilt free chocolate muffins with a cup of tea! I also gave some muffins to my fellow Bootcampers yesterday and so far all positive responses so you definitely need to try them sometime! Preheat your oven to 250 degrees of Celsius and line a baking tray with baking paper. Also boil some water in the kettle for the quinoa. In a bowl mix the grated Parmesan cheese with bread crumbs. Coat the chicken breasts all over with butter and sprinkle with salt and pepper. Coat them well with the parmesan-bread mixture and press it sort of into the chicken. Place the chicken breasts on the baking tray and put the rest of the parmesan bread mixture on top and drizzle with a little bit of olive oil. Cut the paprikas into pieces and place them around the chicken on the baking sheet and brush with a very thin layer of olive oil. Bake the chicken for 15 minutes in the preheated oven until tender. Note that the paprikas do not blacken. Cook the quinoa while the chicken is in the oven. Put the spinach with onions, mint and parsley in a food processor and grind finely. When the quinoa is finished you stirr this spinach mixture through it. Serve the chicken on top op de green quinoa salad with the paprika pieces and some a cherry tomato wedges along the side. 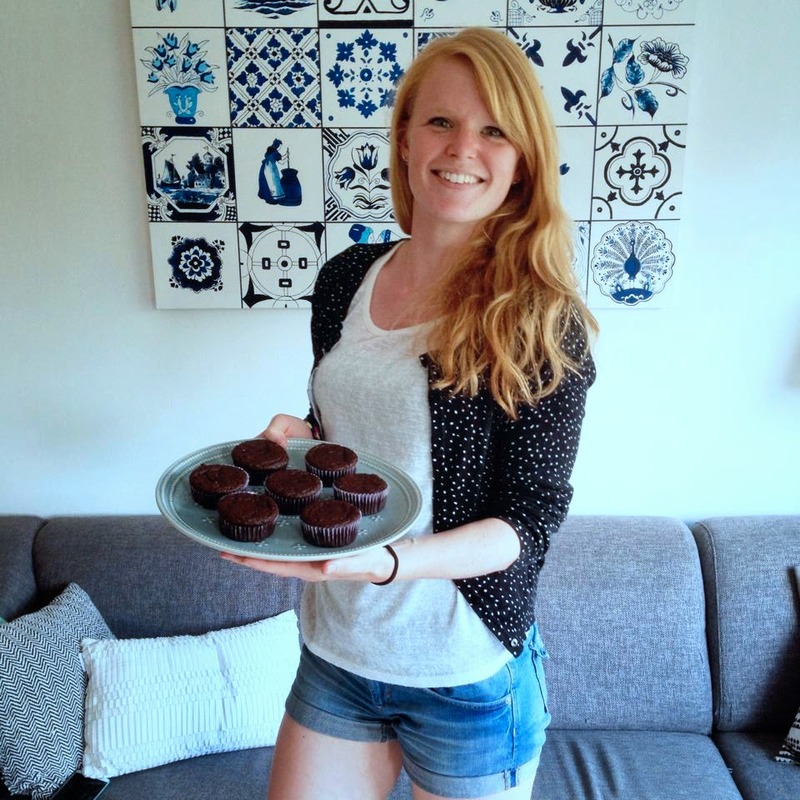 Guilt free chocolate muffins, yes they do exist and are super tasty. The recipe is based on a recipe I found on a Dutch website. The muffins are made of almond meal making them gluten free. Additionally they are refined sugar free as I used dates and bananas instead of sugar. Preheat your oven to 180 degrees of Celsius. Mash the banana and the pitted dates in a bowl using a hand blender. Then whisk through the eggs one by one. Stir in the almond meal, baking powder, cocoa and salt. Add the almond milk and the oil and mix until smooth using a hand mixer. Chop the chocolate into pieces and stir into the batter. Fill 12 muffin tins with the batter and bake the muffins about 35 minutes in the preheated oven. The muffins are done when a toothpick comes out clean and dry. Note that you do not put the muffins in the oven too long so they do not dry out. Preparation tip: preservable for 3 to 4 days in an airtight box or freeze them!